Heritage Location – Backwaters, canals and close to beach. Vinya Retreats follow our vision and mission – A holistic YOGA AND AYURVEDA experience, because we know one is incomplete without the other. Enjoy 10 days of being pampered with healing Ayurveda massages, therapies, consultations, and delicious fresh nourishing organic cuisine – individually tailored to suit You! Immerse yourself in Yoga and Meditation sessions every day in oneness with nature. Connect and discover the True YOU and move towards your higher purpose in life. Experience Cultural activities, Houseboats, Beaches, Elephants, Local Bazaars, Traditional arts and crafts, Astrology and many magical moments! Come with us to Incredible India! 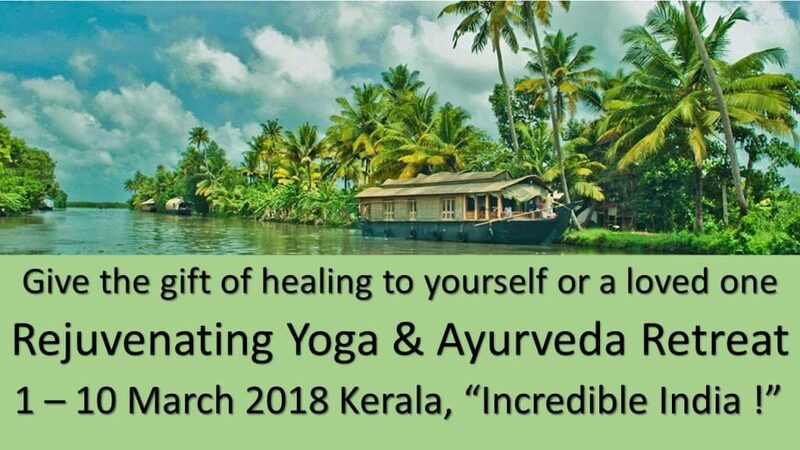 Vinya Yoga and Ayurveda Rejuvenating Retreat in Incredible India! Experience an enchanting historic and spiritual country; whose culture and inspiring people will capture a piece of your heart. Stay at an Exclusive Heritage Retreat Centre in an ambience of a traditional Kerala Home built 70 years ago with breathtakingly beautiful Backwater frontage and close to the Beach. Located at Alappuzha (Alleppey) Kerala, India. 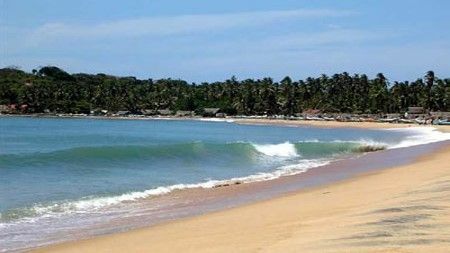 Kerala called “God’s own country” is alive with green, lush and unpolluted natural environment. The surrounding villages with its traditional tiled houses, temples, canals, simple and friendly people offer a unique experience and is the right place to unwind in peace and harmony with nature. March is the perfect season to visit India, where it is cooler and prior to the wet season which offers a more enjoyable experience. Of course monsoons in Kerala is simply another amazing experience! Note: Price excludes airfare. Contact Paddy on 0407 683 110 if you need us to arrange your flights. NOTE: Limited Rooms so please register your interest and participation with a deposit of $200 by the 10th of Jan 2018. The Retreat will only proceed if confirmed bookings of 8+ participants as the venue requires advance payments to secure the space for Vinya. Heritage style air-conditioned rooms with modern private facilities attached. Interiors that reflect the ambience of traditional Kerala homes. Arrangements can be made to book additional tours visiting places like Taj Mahal, Temples, Golden triangle, Mumbai, beaches of Goa, wildlife sanctuaries, etc. Non-Ayurvedic Indian, Continental, Chinese and Italian specialties are also available on request. Please advise at the time of booking, if you require a special diet option. Ayurvedic treatments are enhanced by Yoga and Meditation sessions, which will holistically connect the body, mind and your divine self in this tranquil setting. 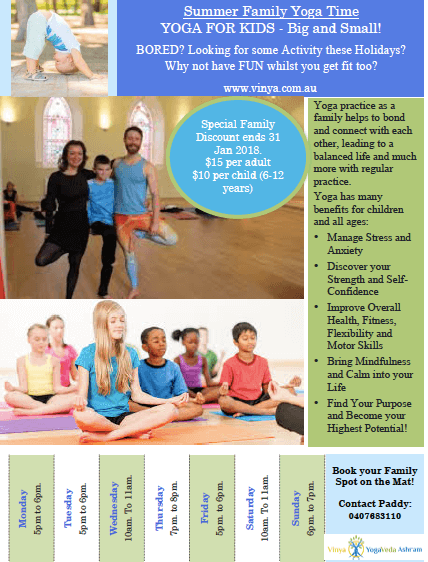 Dr. Jyothi Menon – Vinya’s Australian based Ayurveda Practitioner meets with you pre-trip for consultation and will liaise directly with the qualified practitioners to ensure the best care and treatment during your retreat. Ayurvedic Massage is trusted for over 3000 years as a safe and effective method, all guided and customised by expert Ayurvedic physicians. Re-coup youthful vigour and vitality, improves complexion. Last day of the retreat will be a house boat trip. Cost is included in the retreat price. The resort houseboat is a converted traditional wooden cruise boat with a bright and lively open living area, two comfortable air-conditioned bedrooms, a neat and tidy kitchen, and an experienced personal chef. The sunbath deck offers a passing view of the rustic lifestyle of the locals. The climate in Kerala is moderate and comfortable round the year. All along the cruise, living villages will be passing by. Visa: Tourist Visa required and participants for the retreat are requested to manage their respective Visas. Recommended -comprehensive health insurance before any international travel. Bring any required basic medications. We encourage regular intake of bottled water throughout your stay. Very good hospitals available in Alleppey in case of any requirement or emergencies. Foreign Exchange: Local currency is Indian Rupees (INR) is useful for buying smaller items while out shopping. It is advisable to change some money in Australia into INR prior to travel to save the hassle of looking for foreign currency exchangers or queuing up when you land in India.